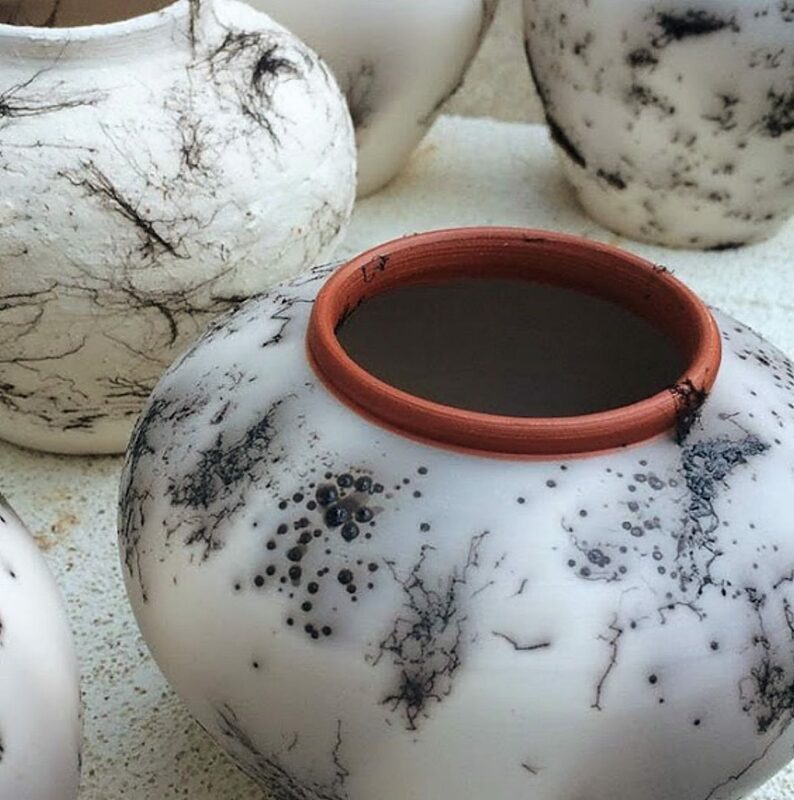 Textures on some of Megan Hood’s cat and dog hair vases show the variety of patterns. No two are alike. 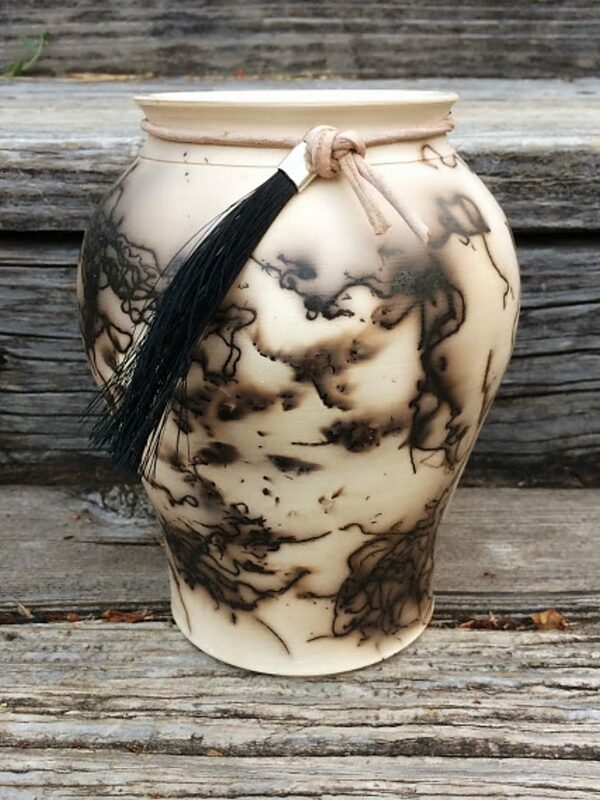 One of Hood's lovely horsehair vases designed as tributes to living or deceased animals. 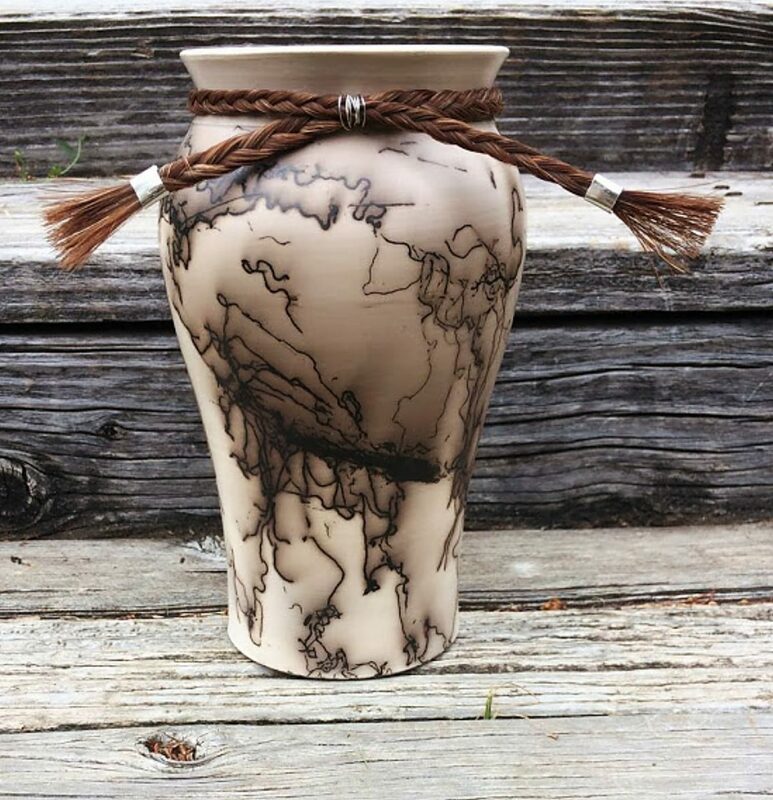 This horse hair vase has an attached braid of horsehair, making the piece even more poignant. 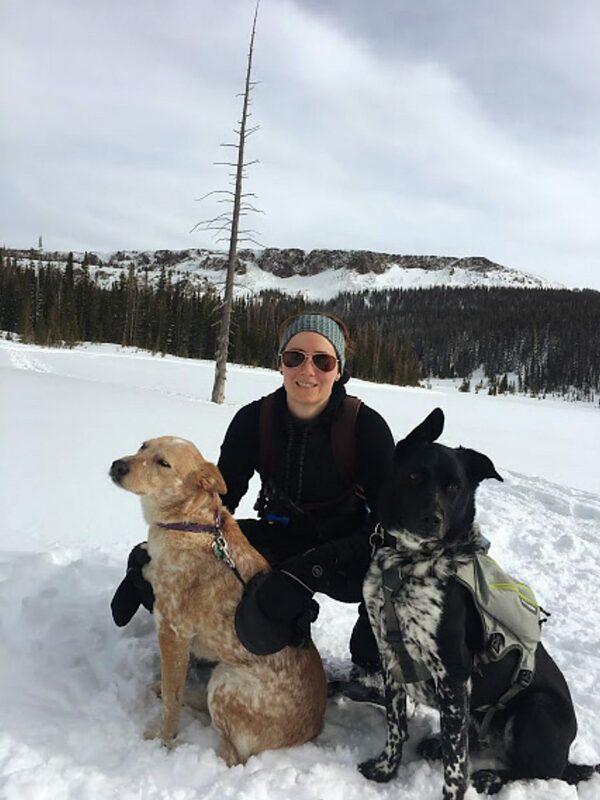 Hood snowshoes with her dogs Ronan and Murphy up the Poudre Canyon in Colorado. 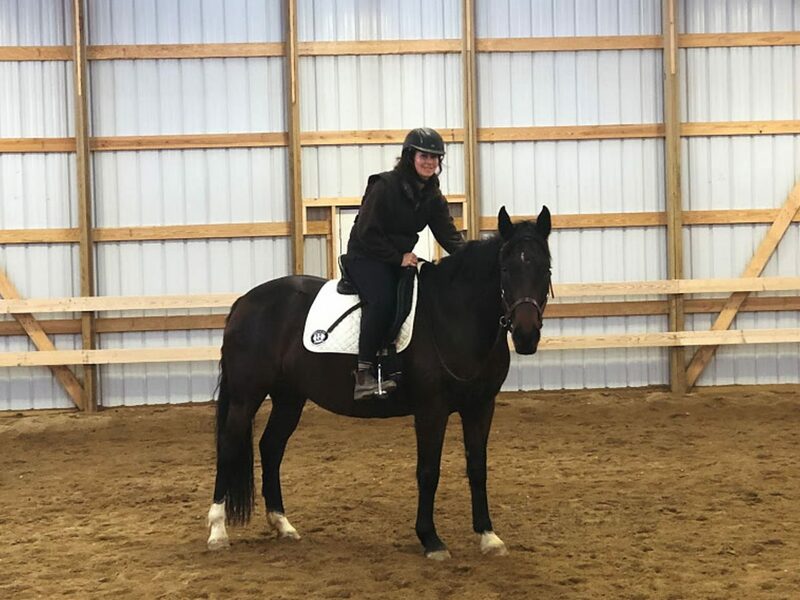 Hood and her mare, Bridgette, enjoy a ride in an indoor arena. 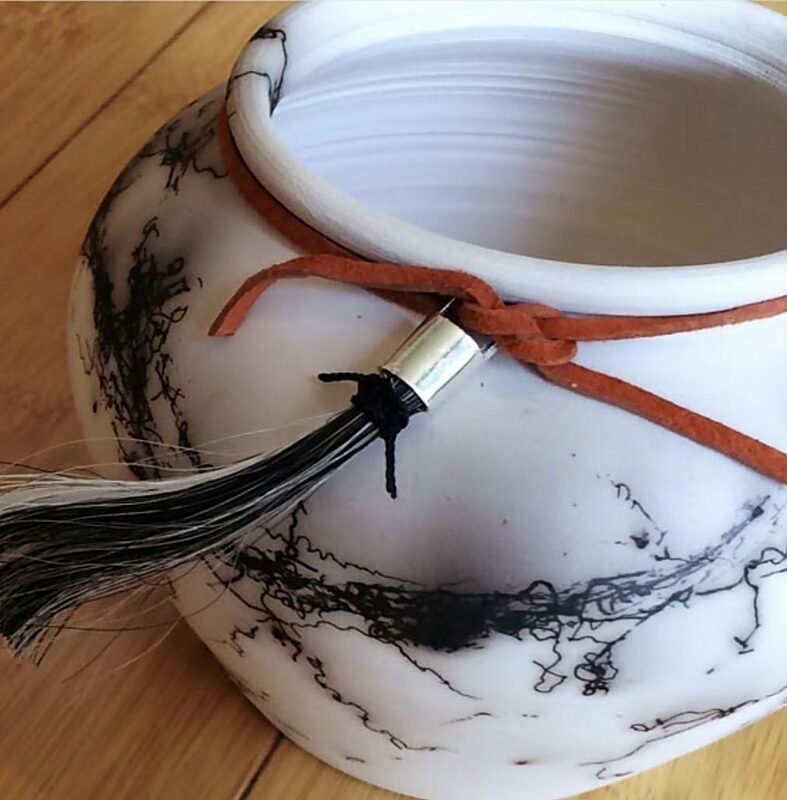 A small horsehair vase with tassel is among the styles and sizes of Hood’s ceramic art pieces. All in a day’s rewarding work: throwing pottery at Hood’s home studio. 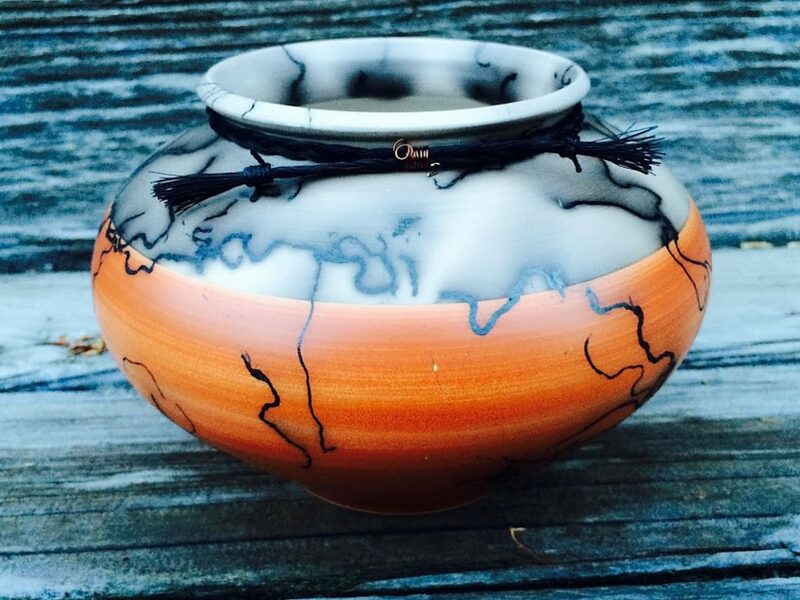 Hood’s horsehair art is inspired by a form once used by the Navajos in the American southwest. 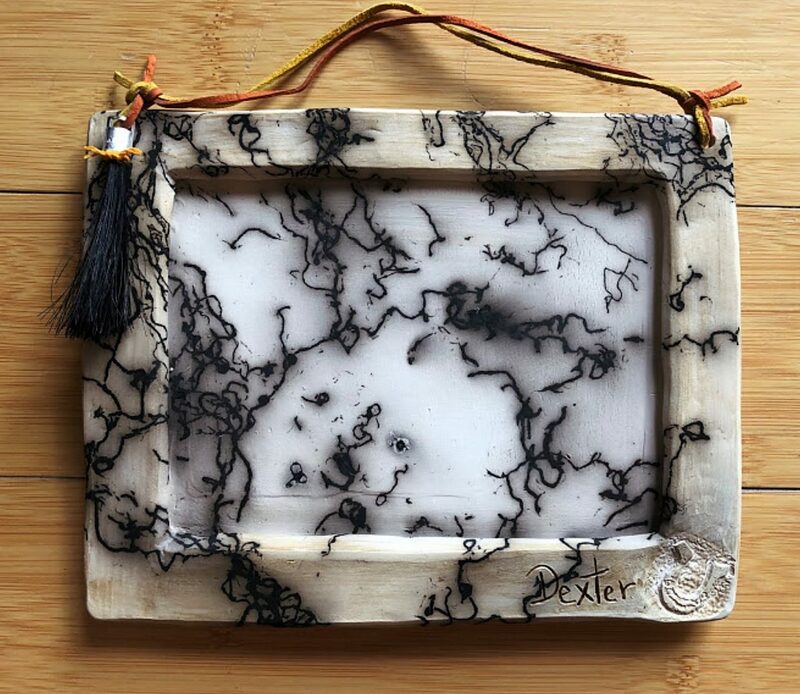 Hood created this ceramic picture frame as a tribute to a client’s gelding, Dexter. When someone's beloved horse dies, Megan Hood John can celebrate its lifetime of devoted service in a beautifully unique way. 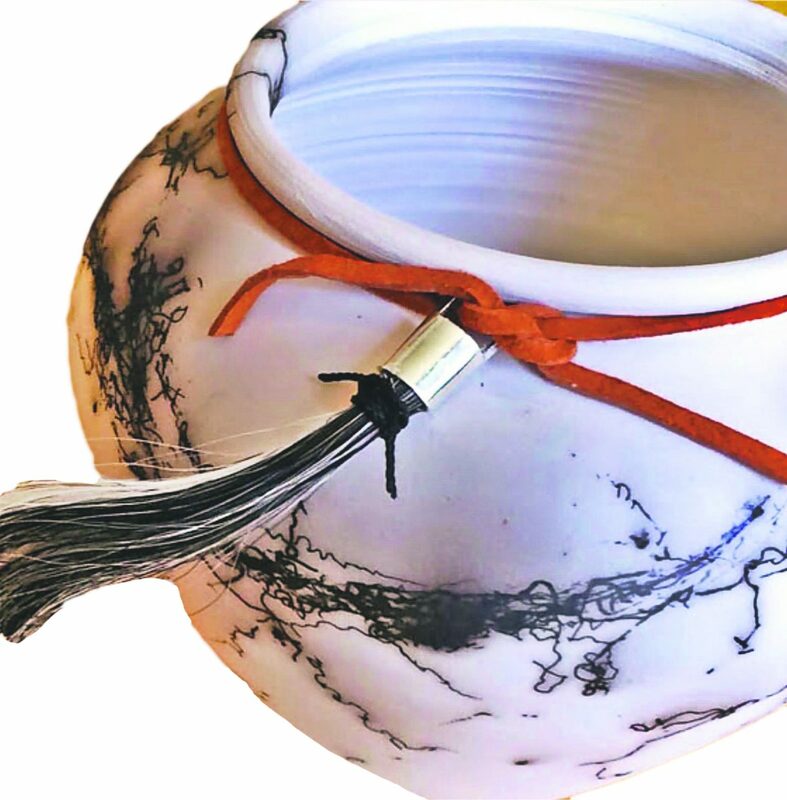 The Fort Collins, Colo., artist (who works under her maiden name, Hood) incorporates the animal's hair directly into ceramic vases, pendants and plaques by implementing a traditional Navajo technique. Her inspiration is based in a lifetime love for animals. Hood was born in California where her grandfather was a jockey and longtime steward at racetracks. Her family moved to Colorado Springs, Colo., when she was just 6-months-old. Hood admits to a serious obsession with horses. She acquired her first one when she was 13-years-old after learning to ride at age 10, when her family relocated to Fort Collins. At about the same time, the horse-crazy girl took a ceramics class. That craft immediately joined horses in her blood so it's only natural that she combined the two passions. 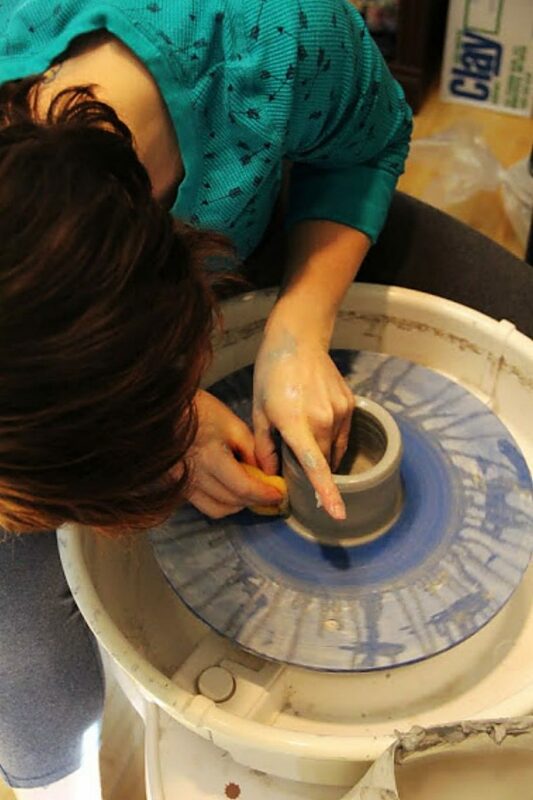 Hood majored in ceramics at the University of Northern Colorado in Greeley, receiving a double bachelors degree of fine art in ceramics and art education. While in college, she used horsehair donated by friends and teachers to perfect her growing and uncommon skill. Now 35, Hood has produced hundreds of pieces. Her one-of-a-kind vases range in size from 3-inches tall to 15 inches. Pendants that hang on leather or other natural fiber cords are also in demand. Hood employs a multi-step method to create her art. The process takes one to two weeks, depending on the piece. It begins with measuring out the necessary amount of porous, smooth low-fire white clay and placing it on the throwing wheel. Similar to terra cotta, it's fired at a low temperature. As she continuously spins the wheel, Hood shapes the object by hand over the course of 20 to 30 minutes. Next, she covers the item until it begins to dry, then trims it before setting it aside for one to two days to complete the drying process. Hood heats her kiln to Cone 06 (approximately 1,828 degrees Fahrenheit) to fire the object and removes it only when eventually cooled to a mere 1,000 degrees. 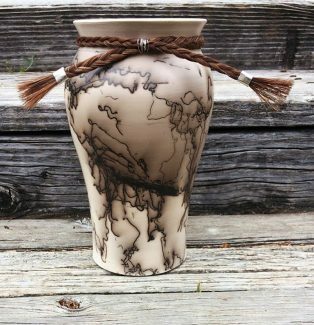 Carefully yet quickly placed on the clay's still red-hot surface at that point, the horsehair burns up; just its carbon traces remain in a desired, unique pattern, trapped forever into the white clay art piece. When it's completely cooled, Hood washes her new creation before adding details such as braided horsehair or other embellishments requested by the client. One really neat trick she uses results in carbon dots and feathery patterns when sprinkled sugar and hair are simultaneously applied. Over the course of the eight or so years she's commercially produced her art, Hood has memorialized many equines. Those cherished animals include Sprint, an Arabian rescue whose owner discarded her when she lost an eye. The still-versatile riding horse was subsequently adopted and lived into her 20s. Sprint's adoptive mom commissioned Hood to make a vase and two pendants, one for her and one for her daughter, when the mare passed. More species merit remembrances for their humans left behind. Hood has incorporated deceased donkeys' hair; a family's pet chicken's feathers; hair from numerous cats and dogs. "One of the most intense commissions I've done was in 2017 when a friend's sister died," said Hood, who incorporated the deceased woman's hair into six small vases, one for each of her children and siblings. "I feel very honored to help people process grief," she said. Hood is currently in the process of fashioning a hanging horse plaque for Megan Rau, a classical riding instructor in Severence, Colo. Hair from her personal mount, Falcon, a Trakhener gelding that died in 2017, will be incorporated into the piece bearing the horse's name and a carved image of that bird of prey. Some clients collect multiple examples of Hood's art. Karen Riedlinger, DVM, owns more than a dozen pieces. When Hood was a teenager, she worked as a summertime nanny for the Wellington, Colo., veterinarian and they've remained good friends ever since. 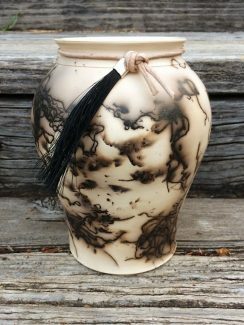 Riedlinger's collection includes horsehair vases, pendants, picture frames and some equine pencil sketches. And, the living as well as the dearly departed can become a part of Hood's art. "Her art is meaningful," Riedlinger said. "I've gifted some and I have a pendant using hair from my gelding that I still ride. It can be fun, not just a memorial. Megan's pendants, for example, are wearable art." Not only is Hood talented, she's also extremely caring and generous. "Megan donates quite a few pieces for charity fundraisers," said Riedlinger, who further recalled young Hood going above and beyond the call of babysitting duty. "She taught my children how to make pottery, including helping them fire and glaze a cat, a cow and some bowls." There's definitely more to art than skill; art requires an intuitive heart and creative instincts. Riedlinger said that Hood always captures a horse's individual personality, even if just from a description of the animal. This summer, Hood and Will John, her husband of 10 years, will be moving to Cheyenne, Wyo., where she will continue teaching art to fifth and sixth graders. The John family includes cats Olive and Hermes, dogs Ronan and Murphy, and Hood's 9-year-old Holsteiner mare, Bridgette.